Leave it to Google to give us a cool tool to examine what the 2008 Presidential Candidates said on various topics including ones that you chose yourself. While it’s probably not fair to rush to judgement on snippets from various media, it is a fun exercise to press spin and see what each had to say. It’s also interesting to see the quotes lined up side by side. 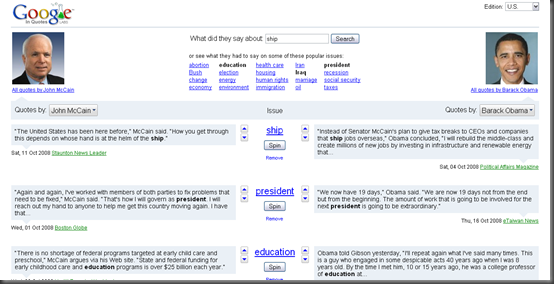 Tagged with Election 2008, Google, President Barack Obama, Senator John McCain.